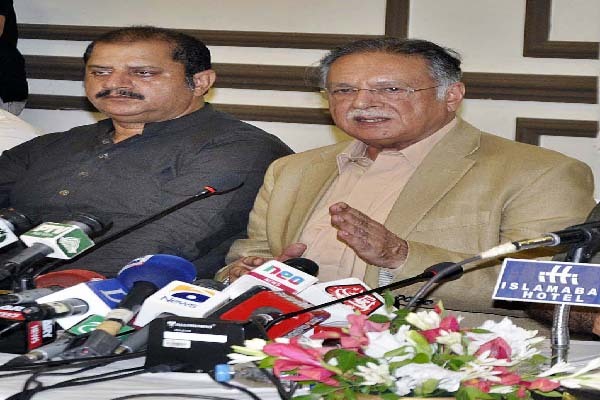 ISLAMABAD, Aug 18 (APP): Minister for Information, Broadcasting and National Heritage Senator Pervaiz Rashid said on Thursday that a strong and stable Pakistan could advocate Kashmir cause at international level in an effective manner and instability in Pakistan at this critical juncture of Kashmir movement could harm the Kashmir cause. media’s role” here, the minister said Pakistan’s support for Kashmir cause was unflinching as it had never shown any weakness in its support for Kashmir. He said the D Chowk sit in of 2014 delayed signing on China Paksitan Economic Corridor (CPEC) agreement and the Pakistani nation had to suffer, but now when there was a need for national unity, if a similar protest sit in was started, it would not only damage the Pakistan’s interests but could also harm Kashmir struggle. He said when PML N came into power in 2013, Pakistan was facing the scourge of terrorism, economy was very weak and energy crisis was at its worst. The present government under the leadership of Prime Minister Nawaz Sharif had stabilized the economy, defeated the terrorists and vercome the energy crisis which had stabilized the country. He said the efforts of the present government to stabilize the country were actually a contribution to Kashmir cause as only a stable Paksitan could fight Kashmir case in effective manner. The minster said Kashmiris had been struggling for their right to self determination even before the creation of Paksitan and those who blame Pakistan for fomenting unrest, actually try to distort the historical facts. self determination and this right was accepted by the entire civilized world. When the people of India were struggling for freedom from British raj, Kashmiris were struggling for their rights against the then Dogra rulers. The minister said it was unfortunate that India was not ready to accept the principle of right to self will under which India itself won freedom from British rulers. He said Prime Minister Nawaz Sharif had raised Kashmir issue in UN General Assembly and reminded the world of its promise to the Kashmiris. He said Kashmir struggle was a collective matter and all would have to participate in it so that the Kashmiris should get their birth right. Instead of granting right to self determination to Kashmiris, India had been trying to crush the freedom struggle thorough the use of state power. The minister said Kashmir was not an integral part of any other country, rather it was integral part of Pakistan as history shows that Kashmiris and Pakistanis hearts beat in unison. He said the people of AJK had endorsed the policy of Nawaz Sharif as 68 pc voter turn out had manifested this fact, while in occupied Kashmir only 2 to 3 per cent votes were casted. He said in occupied Kashmir, Kashmiris had expressed lack of trust in India as they hoisted Pakistani flags in Srinagar and other cities and organize huge anti India demonstrations. apprise them about the Kashmir situation, which they responded within days. He said on the issue of Diamir Bhasha dam, international community rejected Indian stance and accepted Paksitan’s stance. would bear fruit soon, and for this purpose efforts should be made by all Pakistanis to strengthen the freedom movement, he added. prime minister Atal Bihari Vajpayee came to Lahore and accepted that Kashmir was a human issue and should be resolved. Rising above party interests, the PML N government nominated a world famous diplomat President of Azad Kashmir who would plead the Kashmiris’ case at international fora very effectively, he said. He said the PML N had two third majority in the Legislative Assembly and could have nominated any party leader as president as had been the tradition in the past but it kept Kashmir cause above political interests. The minister said Pakistan had always supported the snuggles for right to self will including Palatine, Vietnam and other countries but India had adopted double standards. He said the people of Balochistan enjoy their rights as they had their own elected government, governor, chief minister and a seaport which could be termed as one of the best seaports in future while the Kashmiris had been denied all rights due to illegal Indian occupation.